Victoriana lives at Wadebridge, North Cornwall, in the late 1950s. Running into the station with a local train from Okehampton to Padstow is Class T9 4-4-0 No. 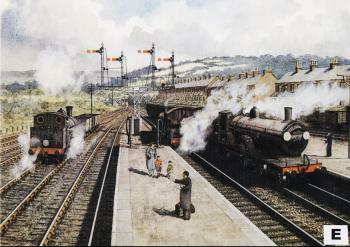 30715, one of the legendary 'greyhounds', while on the left an octogenarian Beattie well-tank shunts wagons. The 4-4-0 was the classic express passenger locomotive of the late Victorian era and the T9s, designed by Dugald Drummond for the London & South Western Railway, were among the most elegant. Built for speed - hence the nickname - they were the LSWR's contender in the great railway race from the West in the early years of this century when it battled with the GWR for the fastest Plymouth to London time with the lucrative traffic off the Ocean Liners. Rebuilt with disfiguring superheater, extended smokebox and a mean little chimney in the 1920s, the T9s eventually went the way of most elderly express engines taking up a life of slippered ease in the country. The steeply graded North Cornwall line though gave the more adventurous of their crews the chance when no one was looking to spin those 6'7" driving wheels at respectable speeds and prove there was life in the old dogs right up to the end. The locomotive on the left is even older; its design dating from 1863, the year The Prince of Wales (later Edward VII) married Princess Alexandra of Denmark. These tiny well-tanks were once used on the LSWR's suburban services from Waterloo but had been displaced by larger engines in the 1890s. Three escaped to the West Country where they were found to be ideally suited to the tightly curved and lightly tracked china clay branch from Wadebridge to Wenfordbridge. For many years this tough little trio, built in 1874/5, were the oldest design at work on BR if not actually the oldest locomotives. Wadebridge was once a classic country railway junction. There where the lines met from Okehampton to Padstow, which was traversed by a portion of the mighty Atlantic Coast Express" from far-off Waterloo and much beloved of John Betjeman; the connection from Bodmin Road on the former GWR main line ('Road' in a GWR station name meant it was miles from the place it purported to serve); and the short branch from Bodmin North. The last named was steeped in history taking in the route of the old Bodmin & Wadebridge Railway, the first railway in the West. The B & W has fame of a sort in the more macabre footnotes of railway history for having once run an excursion train to see a public hanging. In the late 1950s it all seemed so permanent. Then people started buying cars; Beeching proposed the lot for closure and by 1967 all passenger trains through Wadebridge had gone, leaving only a freight service to linger on for a few years.